Take one or more of the guided tours through different aspects of XSOL Workplace including, how it can help you, and how it works. Think of what you can get from Google Maps compared to what you get from a paper map. This is the difference between XSOL Workplace and other methods of describing a business. XSOL Workplace effectively provides you with a &apos;Google Map&apos; of how your business works. It gives everyone the same understanding and makes it real for them by picturing the world in which they work. 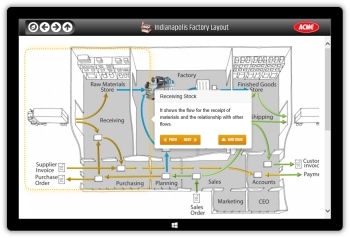 Workplace connects the digital world of documents, spreadsheets and ERP to the real world of offices, desks and machines, and shows the flow of work between them. XSOL Workplace makes it easy for people to spot waste and redundancy, and to know what’s involved when putting in a new system, or merging business units. 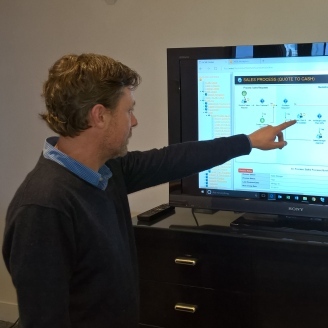 Like Google Maps, Workplace gives you the high level &apos;big picture&apos; and lets you drill into the detail of your business, its processes, workflow and tasks, all of which can connect to things you use - software, documents, other media - both inside your organization and on the Web. Although each of the tours below are independant they follow a sequence that takes you deeper into what you can do with XSOL Workplace and how it acheives this. Click the start button associated with each tour and follow the on screen prompts to find out about what you are viewing and how to proceed to the next step in the tour. 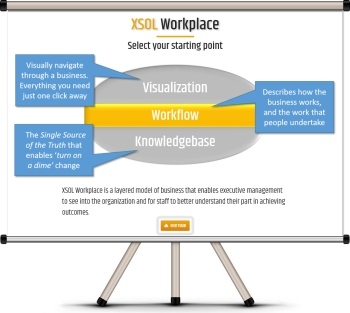 This interactive presentation provides snapshots of the three functions of XSOL Workplace highlighting visualization, workflow, and knowledgebase features. This tour is taken from the perspective of an end-user exploring the content generated from a XSOL Workplace business model. It provides a sample view of what you can capture and then deploy using XSOL Workplace.